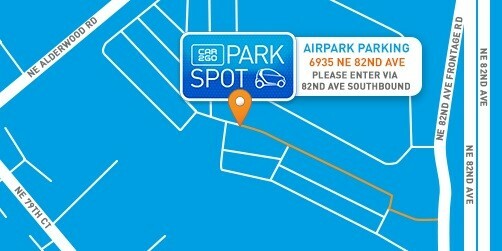 car2go parking is available at AirPark, located next to the Portland International Airport. In addition to your trip cost, it’s just $5.00 for any trips to and from AirPark. It costs just an additional $5 for trips to and from AirPark. Enter the lot at 6935 NE 82nd Ave, Portland, OR, 97220. Proceed to the gate and take the ticket from the machine. Please leave this ticket on the dashboard of the car as the next member will need it to get out of the lot. The AirPark attendant will direct you to the designated car2go parking stalls. End your trip in one of the designated car2go stalls. The stalls are designed to fit two car2gos, so make sure you pull forward to allow room for a second car2go to park behind you. If the spaces are full, the lot attendant will help out! Reserve a car2go as soon as your plane lands via the car2go app – the reservation is good for 30 minutes. Exit through the baggage claim doors and proceed to Island 1 “Courtesy Shuttles” area. Call AirPark at 503-257-2559 to request a shuttle (AirPark is 24/7). Please note that shuttles only come when called and should arrive within 5-10 minutes. When it arrives, inform the attendant you are going to pick up a car2go so they can drop you at your car. The shuttle will drop you off at the designated car2go parking stalls. To exit the lot, provide the ticket from inside the vehicle. You can now return to the Home Area. Welcome back!